John Sayles is one of the signature American independent filmmakers of the last 30 years, creating movies with a precise sense of character and place that illustrate how people are shaped by their geography and circumstance. Unafraid to mix politics into his plots, Sayles has largely worked outside the studio system—he’ll rewrite the occasional Hollywood project to finance his own films—and in that time, he’s consistently produced dramas with a distinctive thoughtfulness. That’s why it’s unfortunate that his latest is one of his weaker efforts. Though not without ideas or affecting moments, Go for Sisters ultimately doesn’t accomplish any of its different objectives well enough to hang together properly. As he often does, Sayles wants to chronicle life at the margins, but this time around he doesn’t have a strong enough story to make these beaten-down characters fly. The film stars LisaGay Hamilton as Bernice, a Southern California parole officer whose romantic relationship with a public defender is going nowhere and whose son, Rodney, doesn’t seem to want anything to do with her. Her latest client is Fontayne (Yolonda Ross), and it takes a moment for the two women to recognize one another. They were friends in high school until they had a falling out over a guy, and it’s now been 20 years since they’ve spoken. Neither woman seems particularly pleased about this unexpected reunion, but Bernice decides to show Fontayne mercy for old times’ sake, declining to write her up even though she violated her parole by associating with a friend with outstanding warrants. That act of kindness would seem to be the end of it for Bernice and Fontayne. (Parole officers can’t have preexisting associations with their clients.) But when a local man is killed—and Bernice’s prodigal son is wanted for questioning—Bernice realizes that Fontayne’s connections might be valuable in tracking down Rodney. Promising to keep their past friendship a secret so she can remain Fontayne’s parole officer, Bernice tries to find her missing son, recruiting a former detective (Freddy Suárez, played with craggy relish by Edward James Olmos) when it becomes clear that Rodney’s whereabouts may lead them to Mexico. What clearly intrigues Sayles are his movie’s smaller, but more resonant themes. Though apart for two decades, Bernice and Fontayne aren’t necessarily that different in the ways their lives have worked out. Both women seem to have accepted that they need to keep their expectations low in order not to get hurt. Bernice’s loneliness and Fontayne’s struggles with addiction are both prisons, and they each recognize that this quest to find Rodney won’t bring meaning to their empty lives—they’re just hoping he’s not dead so as to avoid bringing more sadness into their worlds. With that in mind, Suárez is a perfect companion. 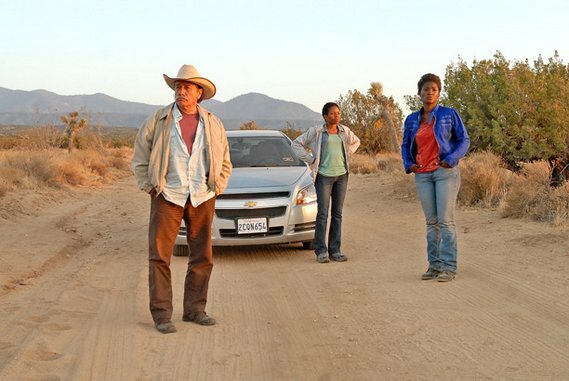 Perhaps too perfect: Although Olmos effortlessly conveys the cop’s weary authority and professionalism, the character comes across as an overly programmatic complement to Bernice and Fontayne. (He, too, has his demons and regrets.) There’s a winning absurdity to these three unlikely people interacting with thugs and criminals to find Rodney. (They’re not the sharp, slick protagonists of your typical noir.) But Sayles doesn’t help his cause by sporadically putting his characters in ridiculous situations in which their lack of experience would almost certainly get them killed in the real world, even if Suárez has their back. But if Go for Sisters is too slack in its storytelling to build up much suspense—its pursuit of Rodney is so metaphorical that it never really grips the viewer—Sayles keeps our interest piqued through the dependable strength of his characterization and by the performances. Bernice’s emotional exhaustion is portrayed simply by Hamilton, who relies on little flourish to suggest the character’s hard, cold surface. (We feel the toll that years of interacting with ex-cons has done to her.) Ross has less to work with—Fontayne is so guarded that she never really emerges from her shell of anger and disappointment—but she nonetheless gets across the character’s weariness and frustration. In these two women’s interactions, we sense how time doesn’t always bring wisdom and perspective but, rather, pain and confusion, robbing people of the possibilities that once seemed so limitless. Pain is everywhere in Go for Sisters—not just for the main characters but also for the people they meet along their journey, many of whom are trying to cross the border illegally into America, hoping for a better life. In a largely pessimistic mindset, Sayles doesn’t see much hope, whether it’s in America or between reunited old friends. All you can do, he seems to be saying, is make the best of it. The resiliency of ordinary people has been central to his films for a good long while—even this one, which may not be so good but nonetheless argues that Sayles remains committed to marching down his own path. It’s too bad that with Go for Sisters, the path doesn’t lead anywhere particularly memorable.